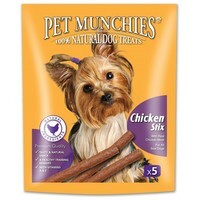 Pet Munchies Chicken Stix for Dogs are delectable, nutritious moist treats made from only the finest human grade real meat. Naturally low in salt and free from artificial colours and flavours, Pet Munchies Stix have been baked to perfection slowly to ensure they retain as much of the flavour and goodness as possible. Perfect for a healthy training reward. Each packet contains 5 individually sealed treats, to keep each one fresh until you need it.